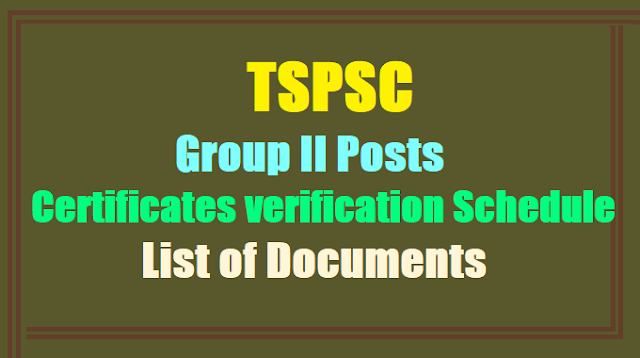 The qualified candidates for verification of Certificates in 1:3 ratio for the various posts under GROUP II Services vide to Notification No.20/2015 dated 30/12/2015 & Notification No.17/2016 dated: 01/09/2016 for which written examinations were held on11.11.2016 & 13.11.2016 are hereby directed to attend for verification of certificates at JAWAHARLAL NEHRU TECHNOLOGICAL UNIVERSITY,KUKATPALLY,HYDERABAD, as per the schedule and produce the following original documents along with one set of Photo-stat copies attested by a Gazetted Officer along with Basic information data (Check-list) and two sets of attestation forms for verification of certificates without fail. 5. School Study Certificate from IV to X Class if studied in School; OR ResidenceCertificate issued by the MRO in case of Private study seven years prior to SSC. 8. Hall Ticket of the Examination. 9. Two latest Passport Size photographs. 11. Attestation Forms in duplicate duly filled in by the candidate and duly attested by anyGazetted Officer. (Download from the Commission’s website). 12/06/2017 and some candidates certificates were verified and the process was stopped in compliance with the Hon’ble High Court stay orders on 12/06/2017. Therefore the candidates were already given ample notice & time to keep all certificates available for verification of certificates. All certificates shall be produce at the time of verification and no additional time will be granted. He / She is further informed that, failure to comply with the above directions may lead to cancellation of his / her candidature.